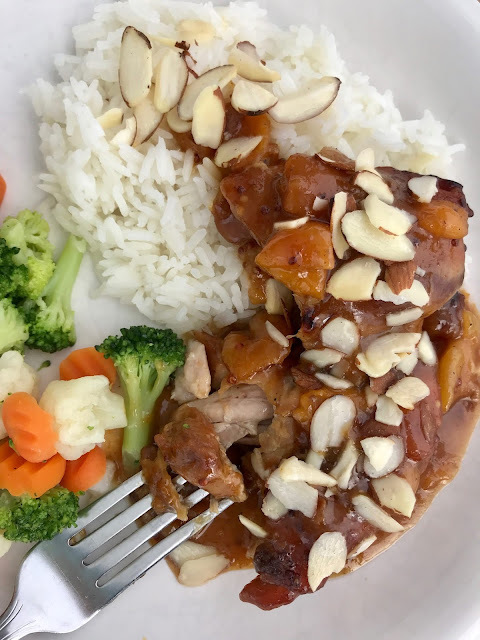 Chicken thighs are cooked until tender in the slow cooker with a sticky sauce of apricots, soy, and mustard, and then topped with sliced almonds for a bit of crunch. 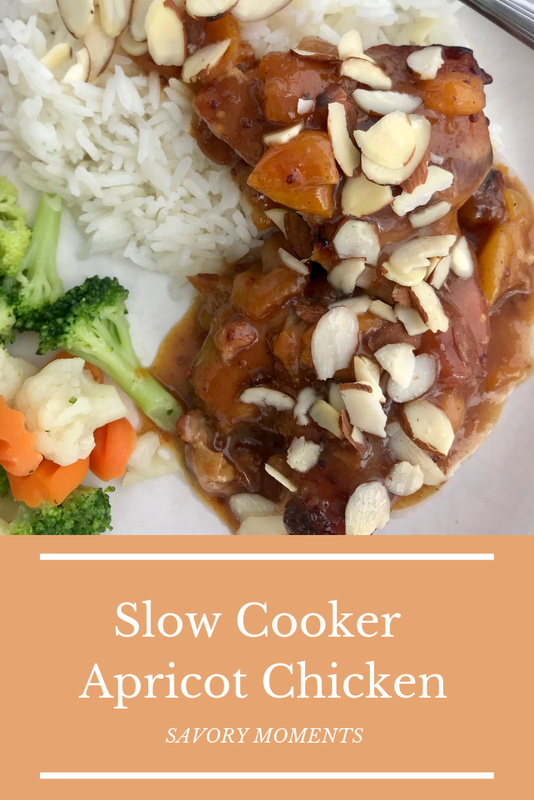 Slow cooker meals are a favorite of mine and I'm going to try to post more recipes utilizing the slow cooker. A lot of the time, I'm just dumping in beef stew ingredients or chicken and salsa, and not really measuring or doing it the same each time. I did an Instagram stories poll and 100% of respondents said they wanted to see more slow cooker recipes this year. That means my slow cooker will be getting more use! 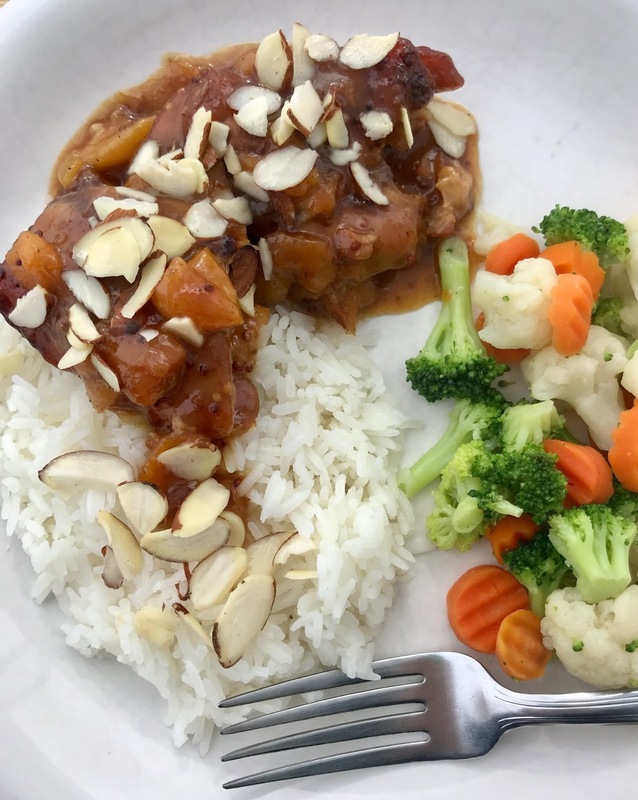 This apricot chicken dish is simple and yummy. I've been trying to find more ways to incorporate fruit into main dishes and meat recipes to encourage our toddlers to try them. This recipe will feed about 3-4 people with side dishes, but you can easily double it for more people or bigger appetites. It's terrific served with rice and your choice of vegetable(s). Lightly grease the inside of the slow cooker with olive (or vegetable) oil. Arrange the chicken on the bottom, sprinkle with a little salt and a few grinds of black pepper, and add in the apricots. In a bowl, or large glass measuring cup, whisk together the soy sauce through corn starch until smooth. Pour over the chicken. Cook on high for about 4 hours or low for about 6 hours, until the chicken is tender and the sauce is thickened. Check for seasoning. Serve with rice and vegetables. Top with almonds, if desired. I love my slow cooker :-)) Love this delicious and fuss free recipe, Amy. I don't have a slow cooker, but I love having a slow braised cooking on the stovetop. Your apricot chicken looks quite yummy. I haven't tried anything similar to this before, it sounds great! This sounds great for my slow cooker! Nice and easy and tasty! Love the idea of apricot + chicken. Neat combo of flavors. This looks SO good -- thanks. My cooking blog is in Spanish with Google translate in many languages hope you liked.